Ancient Greeks believed that cows that grazed on fields of oregano produced tastier meat. According to Aristotle, tortoises who swallowed a snake would immediately eat oregano to prevent death. 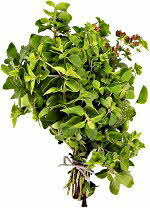 Oregano is also believed to calm nerves and is use to cure sea sickness. Oregano is actually a particular herb flavor, rather than a particular herb. There are several species in different families that impart this particular flavor and are known as oregano.